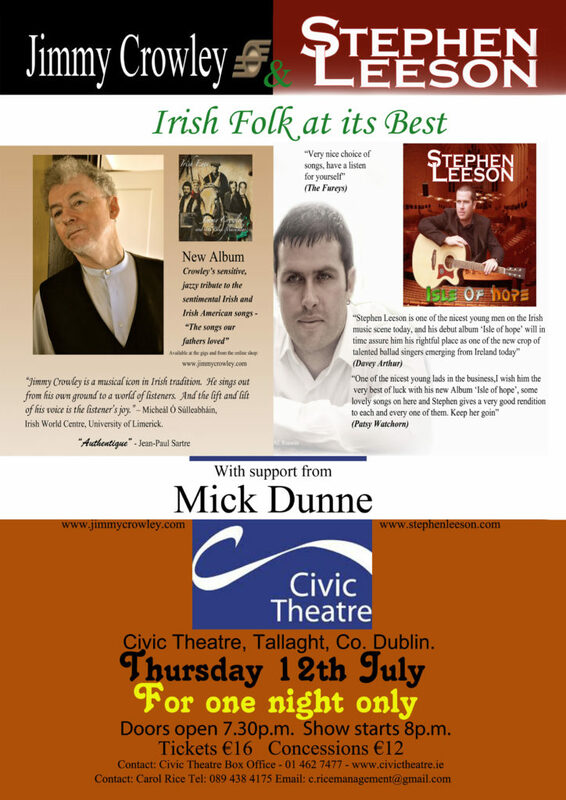 Music lovers are in for a real special magical treat this Thursday 12th of July when two very different but fantastic Irish Folk Singer/Songwriters Jimmy Crowley and Stephen Leeson come together in a production of “Irish Folk at its Best” for one night only, at The Civic Theatre, Tallaght, Co Dublin. Performance commences at 8pm with special guest Mick Dunne, Tickets for the event are €16, €12 concession and are available from the theatre or through their box office on 01 462 7477. 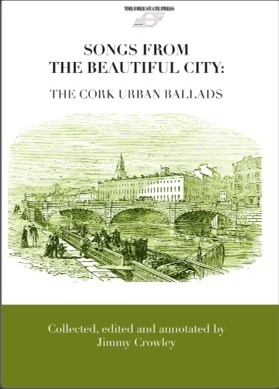 Known as the “Voice of Cork”, legendary singer/songwriter/storyteller Jimmy Crowley has been a central figure in the Irish Folk Scene since the enthusiastic reception of his debut album “The Boys of Fairhill” in 1977 which spreads over four generations. “An uncorked bottle of delight overflowing with good spirits, effervescent vocals and brimfull of good bouzouki and guitar playing.”Dirty Linen. Every album Jimmy Crowley has recorded and produced has been imbued with an excitement and autonomy; has challenged conventions and has been totally different from its predecessor and his new album “Irish Eyes” is no different. After an extensive tour of the US Jimmy Crowley jetted back to his beloved Ireland in early January to release his thirteenth album “Irish Eyes” which breathes an uncommon freshness in jaded classics like Danny Boy, When Irish Eyes are Smiling, Who Put the Overalls in Mrs Murphy’s Chowder and The Isle of Innisfree from the movie “The Quiet Man”, you will be able to catch a glimpse of Crowley magically performing these songs not in the dinner-jacket formulaic style of the classic Irish Tenor nor yet in the unconvincing pecuniary whine of the Showbander; but rather in the relaxed way his hero “Willie Nelson” did the American standards on his Stardust Album and has been successful touring Ireland with the new album receiving tremendous applaud and a lot of national coverage from RTE Radio. Whilst Jimmy Crowley is best known for his folk/Trad style ballads; on this occasion Jimmy has added the jazz chords suffused with caressing French accordion with the keening lap-steel and the Djanjo inspired guitar putting his own unique style to these beautiful almost forgotten songs. A stupendous singer, songwriter, storyteller who’s presence lights up a venue the moment he takes to the stage. With his magical stories which blend effortlessly into his many classic ballads, this well rounded entertainer will brighten up even the gloomiest of days, leaving his audience feel a sense of joy and happiness by the finale of every concert he performs. Stephen Leeson on the other hand is an extraordinary multi-talented Irish Folk Singer, songwriter, musician who has had a magical journey in his musical career since flying solo. Best known for his unique voice, his impeccable stage presence and his versatility as a musician, Stephen has toured all over the world and played with some of the best and most well renowned singers/musicians in the folk industry. His career has had him front man with bands such as: Porter Black, Dublin Legacy and for four years he played and sang with The Dublin City Ramblers. Having just released his new album “Isle of Hope”, Stephen Leeson is an artist who is receiving great acclamation from some well renowned musicians in the folk industry. According to Irish Folk Legend Davey Arthur, “Stephen Leeson is one of the nicest young men on the Irish Music Scene today and his debut album “Isle of Hope” will in time assure him his rightful place as one of the new crop of talented ballad singers emerging from Ireland today”. Last year saw Stephen fulfil the role of special guest with Irish Folk Legends “The Furey’s and Davey Arthur” for a number of gigs in front of a packed audience, with another guest appearance with the wonderful Frances Black in December. With such a mature, deep, powerful voice which is instilled with emotion coming from such a young man, it is hard to believe what Stephen has crammed into his musical CV in such a short spam. With an ability to work the stage and captivate his audience, Stephen’s performance leaves an impressionable impact that is not only memorable but special for everyone that has been afforded the opportunity to experience his live shows. While both artists are extremely looking forward to this performance, it will be a real special/joyous occasion for Dublin’s newest export Stephen Leeson who was born and reared in Tallaght and it will be quite amazing to see him play on his home turf in front of his community who should be extremely proud of his achievements since flying solo in March 2011. Guaranteed to be a tremendous night of real Irish talent and Irish music at its best, this is a concert that is well worth checking out on a Thursday evening.